For every survey you complete with Ipsos Canada, you will earn reward points. Receive an average of four surveys per month, each worth 10-100 points each. Once you reach an account balance of 500 points, you can redeem your points for a variety of rewards from the rewards catalogue. Alternatively, you may donate your points to a great charitable cause. 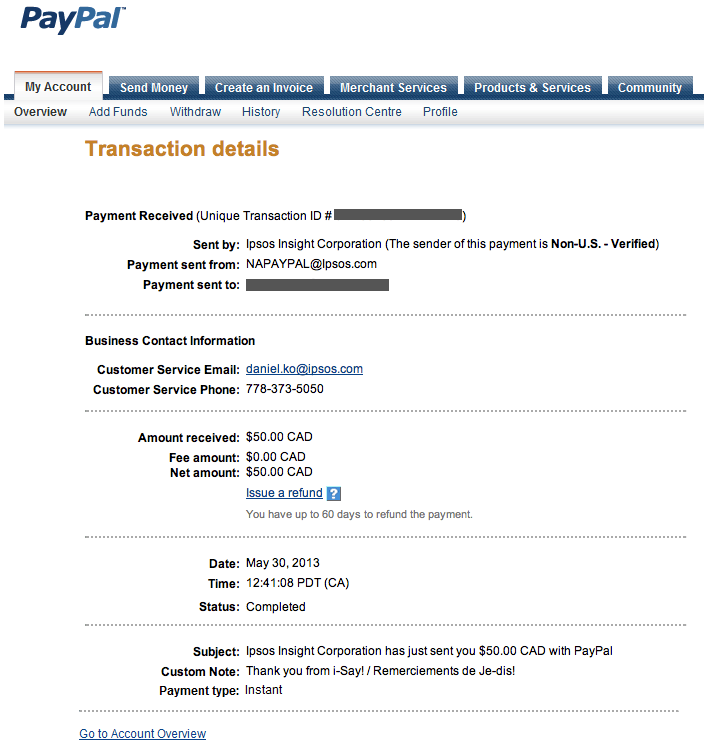 Redeem your points for cash paid via PayPal. Simply visit the rewards catalogue in your account and select the PayPal option. Exchange your iSay points for e-gift cards to Amazon.ca. Available in a variety of different denominations. Ipsos also offers a loyalty program where you can earn bonus points if you have already completed a certain number of surveys in the past. 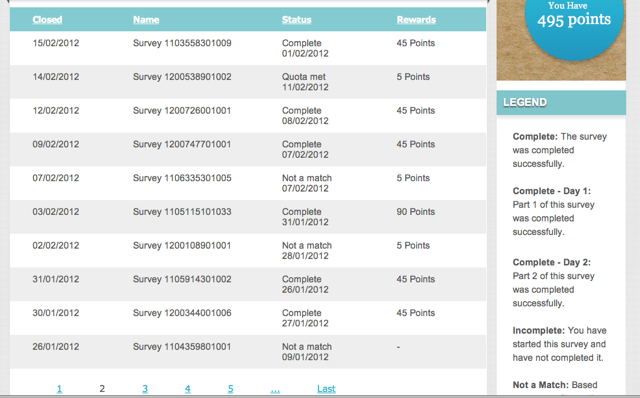 For example, after you complete 10 surveys, you get a loyalty bonus of 50 points. Each month 10 randomly selected panel members are rewarded a bonus 2,500 points just for being a member of the Ipsos community. A $5,000 Monthly Click Draw is held where each time a member clicks on a survey link, they receive an entry. It’s very easy to get lots of entries. Active members as well as new members receive an entry into the quarterly draw for $5000 in cash. Just participate in surveys regularly to keep your membership valid. 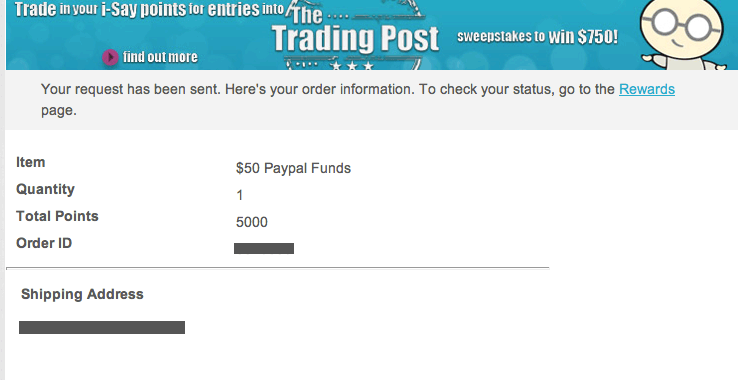 For each friend referred, receive an entry into the $5000 cash sweepstakes. Ipsos offers a special program where when after an online survey is finished, members are asked a random question. They must then guess the percentage of people who answered “Yes” to the question. The closer they are to guessing correctly, the more chances they are awarded to win special prize draws. Once they’ve made their guess, members are told how many entries they have won. They may then allocate their entries towards winning specific prizes. Lucky winners of these prizes are selected randomly and weekly. Helpful Tip! Get more surveys by logging into your account and clicking on “Available Surveys”. You might be too late if you wait until you’ve been e-mailed a survey invitation! The Canada Ipsos Access Panel is managed by the Ipsos Group – one of the largest market research companies in the world who conduct more than six million online surveys in 100 different countries every year! Ipsos has over 5000 clients, which means there are frequently survey assignments available for their panelists. The Ipsos Group has conducted market research since 1975 and is considered one of the most respected market research companies in the world. It’s easy to become a member of Ipsos Canada. Simply complete the short registration form, check your e-mail for a confirmation message and click on the link confirming your registration and you’re finished! From that point on, check your e-mail account for survey invitations from them. The survey invitation will state the topic of the survey, the approximate length of time it will take you to complete it, as well as how many points you will earn for completing it. It is always your choice whether or not you are interested in completing the survey – it is never mandatory or a requirement for anything. How much are the points worth? For example, how much cash would a person get if they had 1000 points? Ipsos is really keen on having their survey takers participate in lots of different surveys, and they reward their members accordingly; the more active you are with Ipsos, the bigger and better the rewards. Yes Peter, becoming a member of Ipsos Canada is 100% free. Simply click on the Join Now link and you will be brought to a registration form which once you complete will make you the newest member of Ipsos! In fact, all of the survey companies listed on our website are 100% free to join. For a complete listing, check out our surveys list. Will I receive my payment in the form of a cheque? And will my income from taking surveys ever be taxed by the government? For instance, will I have to provide you with my social insurance number? Ipsos Canada offers its members the opportunity to redeem their points for cash and yes, this is issued to their members in the form of an authorized cheque which is mailed. Your income from online surveys is taxable the same way any other income you earn. Because you would not be employee of a survey company when you take surveys, you would not be issued a T4 at the end of the year. You would simply be responsible for tallying up your earnings and reporting them on line 104 of your personal income tax return entitled “Other Income”. You do not need to provide a survey company with your Social Insurance Number because you would not be an employee. Your SIN is something you should guard closely and is never something a reputable survey company would ask you for. To join Ipsos Canada, you must 18 years of age or older. However if you are looking for survey companies open to younger Canadians, you may wish to take a look at our Canadian Teen Surveys page.